Just like that person in Mumbai who says, ‘Once you have tasted the Vada Pav in Mumbai, you won’t enjoy it anywhere else!’, I would describe Holi in Mathura & Vrindavan in the exact same way! Yes, their energy and passion can be compared with that of Mumbaikar’s during Ganpati, Bengali’s during the Durga Pooja, Gujrati’s during Navratri & Punjabi’s during the entire year! Holi Celebration is not just a tradition over there but a portrayal of undying faith & passionate devotion for India’s beloved Radha & Krishna. 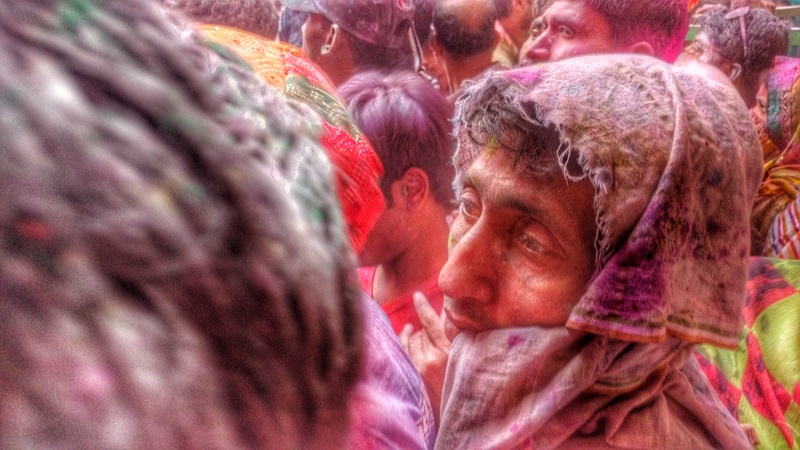 It’s a week long festival in Uttar Pradesh which ends with one of the most exciting customs, Huranga Holi. If you want to experience the festival throughout, plan 8 to 10 days of vacation in advance. We celebrated two of the most important festivals Holi & Dhulivandan, at the famous Banke Bihari & Dwarkadheesh Temple in Vrindavan & Mathura respectively. And the speciality of these two places is the way in which the festival is celebrated. In Banke Bihari, a huge crowd chant the famous lines “Hathi, Ghoda, Palkhi…Jai Kanhaiya Lal Ki”, after which the Pundits of the temple raise the curtains over the Krishna’s Idol. Louder the chant, quicker the revelation! And once the idol is revealed the crowd goes crazy and chants the famous words “Radhe Radhe”. The atmosphere inside the Durbar of this grand & ancient temple is surreal. If you close your eyes & listen to these chants, you will actually feel the devotion inside you. This is best experienced in person & no metaphors or adjectives can be used to explain this phenomenon. The word Banke means bent in three places – if you observe an idol of Krishna, he is bent in three different points – hand, waist and legs. 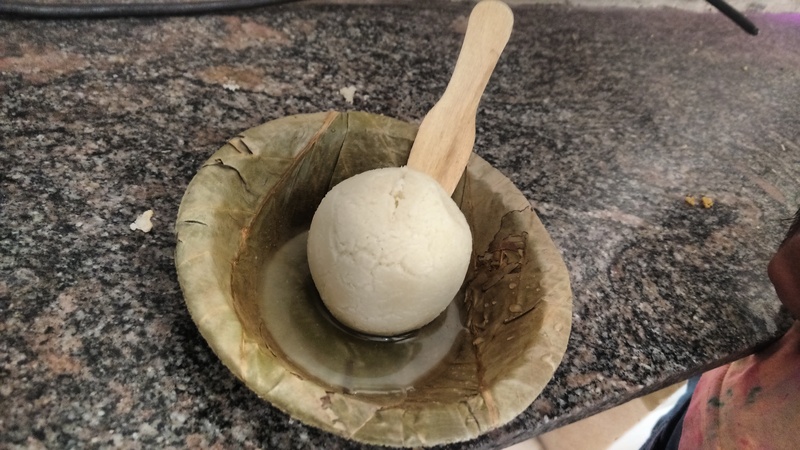 Whereas, Bihari means a person, who seeks enjoyment in every little thing and hence the name Banke Bihari – the perpetual enjoyer of things in life! We then went to the Dwarkadheesh temple in Mathura where the alluring alleys of the city were in jovial mood & had already smeared themselves in various colours. The Dwarkadheesh Temple is one of the most famous temples in India & has a very interesting way to celebrate Holi & Dhulivandan. In the main Durbar of the temple, a pundit plays the Dhol while the devotees sing various songs which narrate Krishna’s life stories. On the beats of the Dhol along with the Tashe, the devotees enthrall the audience with a beautiful symphony of percussion, chants & colours. The feeling is actually elating and it feels as if you have reached the pinnacle of happiness & nothing in the world can disturb your Dhyan. Dwarkadheesh, as the name suggests, is a temple dedicated for the King of Dwarka, Lord Krishna. On the day of Holi we visited the Banke Bihari in Vrindavan which was followed by sipping hot tea & munching on hot Kachoris & Rabdi in the alleys of Vrindavan. After which we took a rickshaw back to Mathura where we were left in awe by the magnificent architecture of the Dwarkadheesh temple coupled with the colourful attire of the revellers & devotees. Shops and Restaurants are closed during Holi for obvious reasons. We had a heavy breakfast before we left for the day but as the day passed by the thought of Puran Poli, Curry and hot Samosas made our stomachs too weak in their knees. 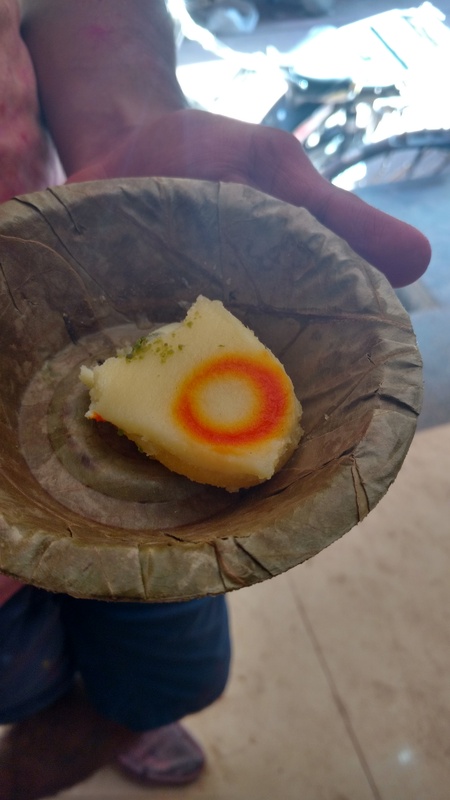 But luckily we found a sweet shop where we relished upon some delicious Dhokla which was soaked in a syrup and equally tantalizing sweet dishes – Malai Sandwich and Rasgulla! 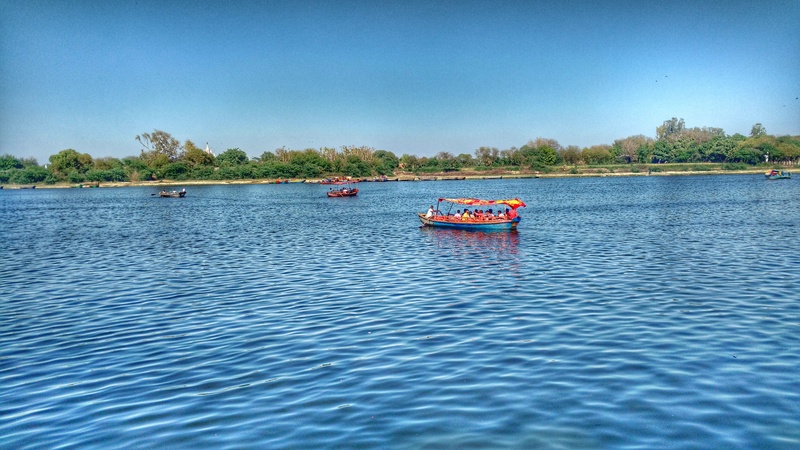 We then decided to chill out at the famous Vishram Ghat in Mathura where Krishna rested after defeating Kansa. 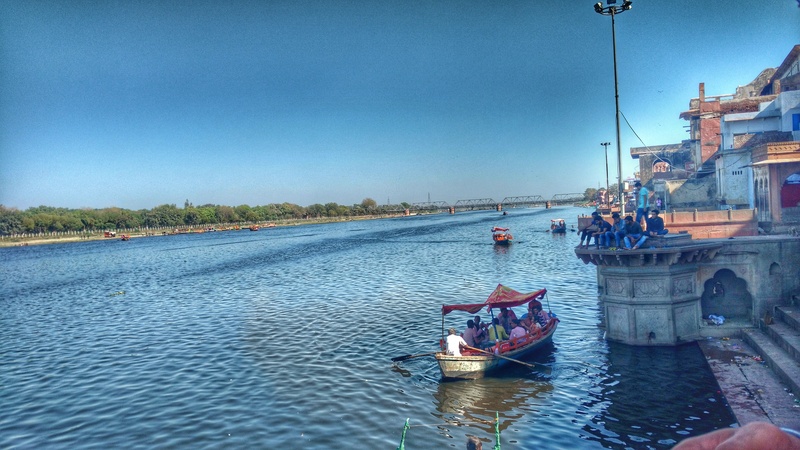 The ghat is partially clean and offers a serene view of the Yamuna River. Watch out for Monkeys at the ghat! Considering the fact that we were low on budget, our guest house was below average. You can always find good places in both Mathura & Vrindavan if you are ready to spend some extra bucks for comparatively convenient stay. Our experience in Muskaan Guest House was pretty bad. Nevertheless, it was overshadowed by the merriment & the joyous hours spent at Banke Bihari & Dwarkadheesh. 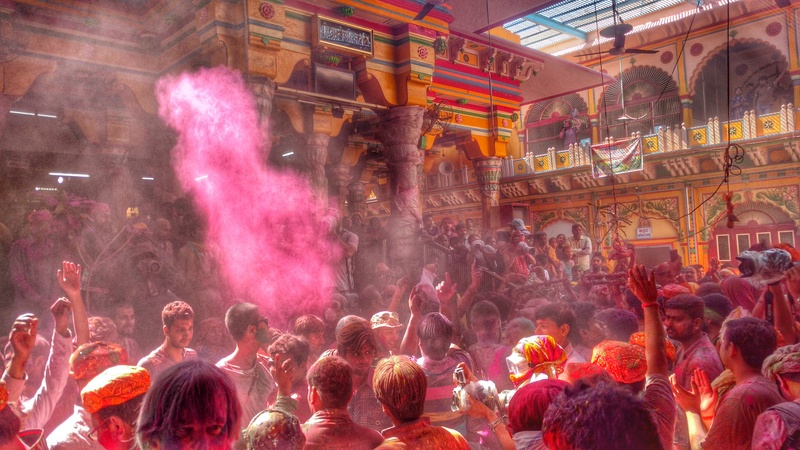 Next year, I plan to visit Mathura during Holi once again but this time it will be more adventurous. Yes, I am talking about the Lath Maar Holi & the Huranga Holi! 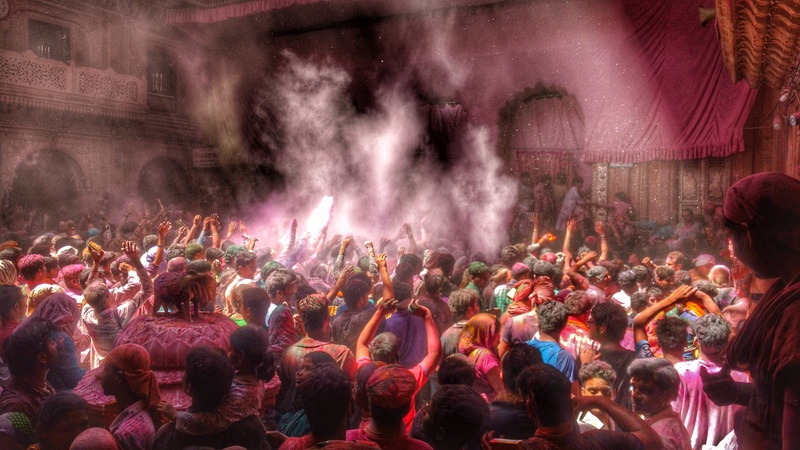 One of the best things of Holi in Mathura is that you won’t miss the one in Mumbai. It is rustic, authentic & charming in all aspects. Mathura & Vrindavan was one of a kind experience & to be honest every Indian should celebrate Holi in these ancient & historical towns.